IT'S BEEN tough being an investor the last several years, but a record 3,052 students eager to test their skills have taken the plunge this spring in the Hawaii Stock Market Simulation program. The interactive competition, which helps students learn how the U.S. market system works, kicked off on the state's four major islands on Monday with 99 teachers representing 64 schools. The program, which also is held in the fall, allows teams of two to four students to invest a hypothetical $100,000 in stocks, bonds and mutual funds over a 10-week period. "The main goal is to encourage the students to think about saving for their future," said Kristine Castagnaro, executive director of the Hawaii Council on Economic Education, which administers the program. "The students are asked questions about what is their goal for savings. Is it retirement, is it college and what kind of risk can they take? This question is asked to them over and over again in different formats, and when they answer it, they find out what kind of investor they are. It's called an investor profile." Students, who are in grades 3 through 12, can participate in four categories. The aggressive division requires that portfolios contain 80 percent stocks and 20 percent bonds. The growth-division portfolio must contain 65 percent stocks and 35 percent bonds. The income/growth division requires 50 percent stocks and 50 percent bonds. And the elementary division does not have to contain bonds. The first- and second-place team members at the end of the 10-week period receive $100 and $50 savings bonds. The program is funded by the state Department of Commerce and Consumer Affairs Office of the Commissioner of Securities. Castagnaro said the Stock Market Simulation program started in Hawaii in the fall of 2000 with 183 students and has grown steadily. "We found the most growth when we partnered with the state DCAA," she said. "Most of our participation is at the high school level." The students don't compete against each other but rather a benchmark for their division, Castagnaro said. "Participating in a simulation gives the students a taste of what the real world of investing is like and gives them a chance to make mistakes where the consequences are not so high," she said. In the first week of the program that ended Friday, Lahainaluna High team 605423, taught by Sharon Saribay, was first in the aggressive division with a 7.4 percent increase to $107,432.88. 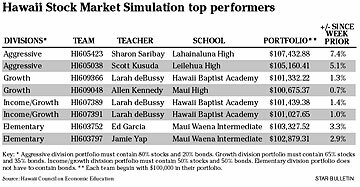 Hawaii Baptist Academy team 609366, taught by Larah deBussy, led the way in the growth division with a 1.3 percent gain to $101,332.22. Hawaii Baptist Academy team 607389, also taught by deBussy, topped the income/growth division with a 1.4 percent gain to $101,439.38. And Maui Waena Intermediate team 603752, taught by Ed Garcia, was first with a 3.3 percent gain to $103,327.52. "If the students leave this experience understanding the value of diversification, asset allocation and rebalancing, then it's a success," Castagnaro said.